Leeds West Indian Carnival has elected its king and queen as the event celebrates its 50th anniversary. Eleanor Claxton, 27 and Athan Martin, 21, were picked after a competition at West Yorkshire Playhouse. Ms Claxton, from Chapel Allerton, was crowned with her costume Hellfire Heaven Reign, which involves a dancing devil that turns into a angel. The winners will lead the carnival parade on its way around the city from Potternewton Park on Monday. Mr Martin, from Leicester, was chosen as king with his costume Splendour of the Glorious Sunset. 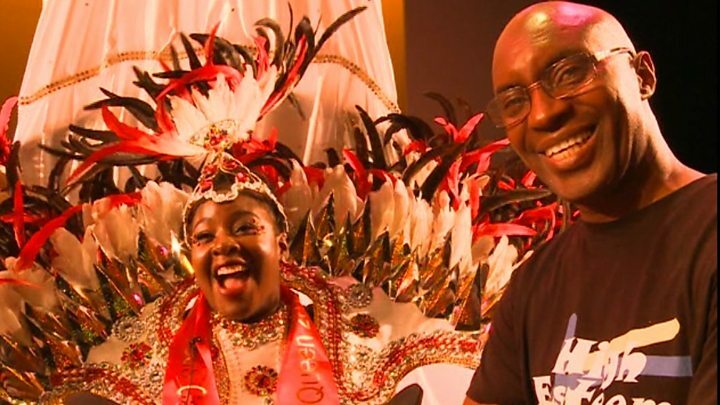 Ms Claxton, who was crowned carnival princess twice when she was a child, said it had been a difficult couple of months working on her costume. She said: "I've been up till daft o' clock every day this week and it's all been worth it." Her outfit was designed by Leeds-based carnival artist Hughbon Condor, whose costumes have won half of the last 30 carnival queen competitions. The West Indian Carnival started in 1967 and has since taken place every year. It takes place over three days of the bank holiday weekend and culminates with the parade on the streets of Chapeltown and Harehills, with an attendance often estimated at about 150,000.